Today I am in mourning for my xbox 360. After 4 years of long service it finally red ringed last night while I was trying to play my first proper sidequest on Mass Effect 2. I feel a need to mark its passing somehow. I bought it way back in spring 2006 if memory serves – it was a first generation machine, obnoxiously noisy, occasionally buggy, and lacking an HDMI port. 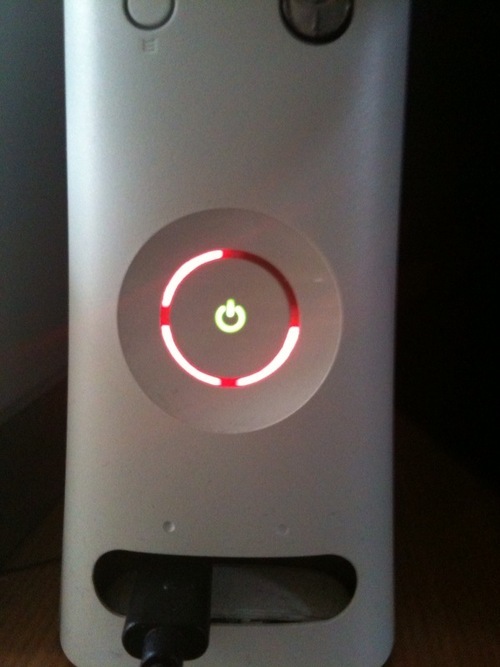 While other people swapped broken consoles constantly thanks to Microsoft’s poor performance – I have friends who went through 4 360s in a year thanks to the dreaded red ring – mine soldiered on quite cheerfully. It survived 6 house moves – including going from Newcastle to Norwich wrapped in T-shirts in a suitcase on the train. It saw me through relationships ending, through graduation and a career change and my NCTJ prelims. It saw me married. When thinking about major time periods in my life, I can link them still to the games I was playing at the time. All, or almost all, Xbox. Second year of university, wrapped up in work and writing constantly – Oblivion. Applying for jobs after uni – Guitar Hero 2. Breaking up with a long-term partner – Assassin’s Creed. NCTJ course – Portal, Braid, Fallout 3. And looking back it’s striking how often I played out the conflicts and themes in meatspace life through gaming. In periods of intense factual learning I gravitated towards puzzle games with neat solutions; when I felt I couldn’t get anything right I retreated to conquerable, affirming rhythm games; at times of uncertainty and doubt I repeatedly threw myself off tall buildings. Gaming has been self-care and healing, escapism, social interaction, fun, exploration, achievement and space where achievement no longer matters. It won’t end here – I have every intention of going out today to pick up a replacement. But this does feel very much like the end of an era. The next one won’t be the same. I wonder if this is how I’ll feel if my iPhone ever dies.